Image Source - TREES, ASSOCIATES, and SHIGO (2 CD set). Root Hairs - A root hair is the extension of a single epidermal cell, epidermal, which means skin. Root hairs absorb water and elements dissolved in it. Root hairs are organs that grow within days when water, temperate, and soluble essential elements are at optimum levels. Root hairs "come fast" and "go fast". They die and are shed after a few weeks. A root hair is the extension of a single epidermal cell. Root hairs and mycorrhizae are alive and well in midwinter in non-frozen soils during warm spells and non-frozen soil below frozen soils. As root hairs and mycorrhizae die, they add organic material to the soil. Non-woody roots shed dying and dead root hairs and epidermal cells. The shed cells are digested by soil microorganisms. They recycle elements essential for life. 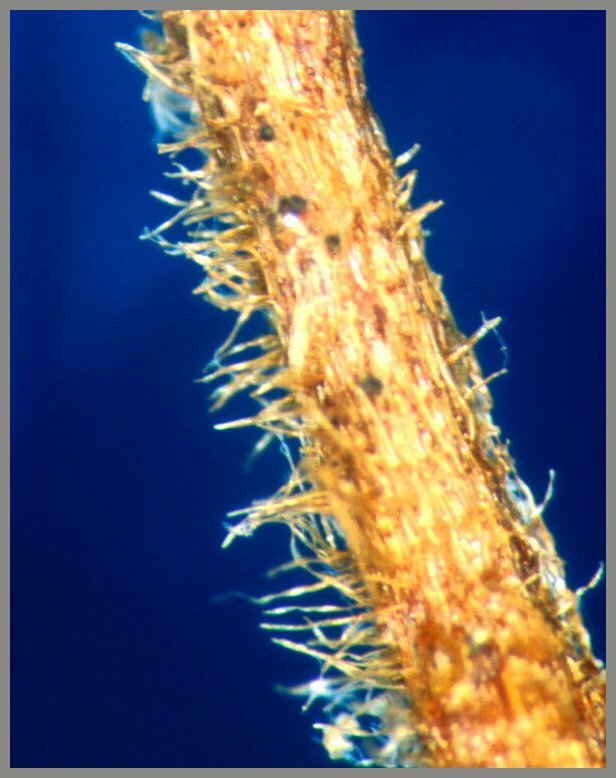 Root hairs often grow on mycorrhizae. See "Root Hairs / Mycorrhizae".